An excellent family toothpaste to promote good oral hygiene. 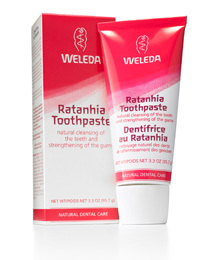 Herbal extracts of Ratanhia (Krameria) and Myrrh help keep the gums and oral cavity healthy. The fine chalk base thoroughly cleanses without damaging the enamel of the teeth. It has a refreshing taste and natural flavour from Peppermint and spearmint pure essential oils. Water (Aqua), Calcium Carbonate, Glycerin, Magnesium Aluminum Silicate, Alcohol, Krameria Triandra, Commiphora Myrrha, Mentha Piperita (Peppermint), Mentha Viridis (Spearmint), Foeniculum Vulgare (Fennel), Xanthan Gum, Ammonium Glycyrrhizate, Limonene*.